After many long centuries, the papacy had finally met its end. No, we are not talking about the current problems of the Roman Catholic Church, with the resignation of Benedict XVI and revelations of corruption at the highest ecclesiastical levels. This supposed earlier demise was two centuries earlier, and it provides some historical counterpoint to the trials through which Catholicism is now suffering. Opposed for decades by an alliance of Jansenists (whose views on grace had fallen under papal anathema) and Gallicans (who sought a semi-independent national Church); repudiated by the French clergy, the majority of whom swore fealty to the Revolution over Rome; seized by the revolutionary armies that were ravaging his lands, the pope at last died in French captivity in 1799. “Citizen Braschi. Occupation: pontiff,” read the record of Pius VI’s death. The barque of Peter had sunk. The gates of hell had prevailed. Voltaire’s battle cry against the Church, “écrasons l’infame!”—“Crush the loathsome thing!” had come to fulfillment. It was the dawn of Diderot’s utopia, the last king strangled with the guts of the last priest. Or so the enemies of the Church hoped. But, as so often happened throughout the long nineteenth century, here the Austrians came through. Despite a rocky relationship with the papacy—Emperor Joseph II’s anti-monastic policies had provoked Pius VI’s protests—the Austrian government provided protection for the cardinals to convene in Venice (then under Austrian rule) and choose Pius VI’s successor. This unusual election of 1800 placed Pius VII on the papal throne. The new pope immediately went about restoring the papacy’s prestige, beginning with the unprecedented Concordat of 1801, in which Pius VII went over the French bishops’ heads to negotiate directly with Napoleon, thus securing freedom for the Church and paving the way for a religious revival. Neo-gothic architecture, miraculous apparitions, and renewed interest in scholastic theology—not to mention packed pews, seminaries, and convents—all followed in due course. Though titled Vatican I, Fr. John W. O’Malley’s slim new volume treats in equal measure the currents that led up to the Council. In Chapter 1 (“Catholicism and the Century of Lights”), O’Malley chronicles the rise in the eighteenth century of ideologies that were, to varying degrees, hostile to the Church. During this era of Enlightened despots, Gallicanism in France, Febronianism in Germany, and Josephism in Austria all aimed to make the Church docile to the state and curb the influence of the papacy. Although the pontificate of the broad-minded Benedict XIV demonstrated that Christianity and Enlightenment could coexist peacefully, the Enlightenment often took forms antithetical to Christian revelation. This ugly underbelly of the Enlightenment was exposed to all in France, where, amidst the Terror, the biblical seven-day week was abolished and Notre-Dame de Paris was rededicated to Reason. In the wake of this chaos and in reaction to the ideologies that spawned it, Romanticism arose, as exemplified by François-René de Chateaubriand’s magnum opus The Genius of Christianity (1802). This work, and the intellectual movement to which it gave rise, celebrated in Christianity the spiritual and supernatural, fast and feast, the liturgy and the sacraments—that is to say, everything about the faith that was least comfortable to Enlightened sentiments. A particularly influential offshoot of this Christian Romanticism was the “Ultramontane Movement” (the subject and title of Chapter 2), which took Catholic Europe by storm following the 1815 Congress of Vienna. As the Continent’s deposed monarchs returned triumphantly to their thrones, the Catholic Church’s monarch began to take on a larger role in the minds of his subjects. Broadly defined as “the exaltation of papal authority over political and episcopal authority,” Ultramontanism (from ultra montes, “on the other side of the mountains”) was coined to describe the tendency opposite to Gallicanism. Whereas the Gallicans promoted the ideal of a more independent French Church, the Ultramontanes stressed the pope’s authority to govern the Church from over the Alps in Rome. As an ecclesiological position, Ultramontanism thus had a long history, and in its more moderate forms it was scarcely distinguishable from the age-old faith in papal primacy. Still, the Ultramontane Movement of the nineteenth century was something new, as two of its leading exponents show. The first of these, Joseph-Marie de Maistre, found in infallibility, the dusty and uncontroversial theological principle that the Church could not err in proposing dogma, a practical solution to the political ills of his day. In Du pape (1819), de Maistre—a layman whose broad learning, tremendous energy, and elegant style made up for his lack of theological training—contended that only the sovereign power of an infallible pope could provide the foundation for an ordered society. Although plenty of clergy, above all ordinary priests, were drawn to this style of thinking, it was other lay writers who most prominently took up the Ultramontane mantle. In 1848, the indefatigable Louis Veuillot took over L’Univers and transformed it into France’s leading Ultramontane journal. Despite public spats with the Parisian Archbishop, bizarre views on classical literature (Veuillot advocated banning from schools the pagan Classics so beloved by the philosophes), and an almost blasphemous tendency to assimilate the pope to the divine persons of the Trinity, Veuillot curried favor in Rome from early on, and so maintained the pope’s good graces throughout his long career. Thanks to L’Univers and allied journals, lay readers of every major European language began consuming Ultramontane ideas with breakfast. It should be no surprise that the momentum to define papal infallibility came from below. Although the First Vatican Council (1869–70) is chiefly remembered for promulgating the dogma that the Roman Pontiff is safeguarded from error in his ex cathedra pronouncements, there is no evidence that Pope Pius IX intended papal teaching power to be the focus when he convoked the Council. As O’Malley explains in “The Eve of the Council” (Chapter 3), the Ultramontane press began to push for papal infallibility between the initial call for the Council and its opening session. At this point, the pope’s infallibility in defining dogma was almost unquestioningly accepted within the Church: After all, two decades had passed since Pius IX invoked infallibility to proclaim the Virgin Mary conceived without original sin. Nevertheless, by objecting too vehemently to Ultramontane appeals for clarification, a few anti-Ultramontane churchmen made papal infallibility the inevitable item on the Council’s agenda. 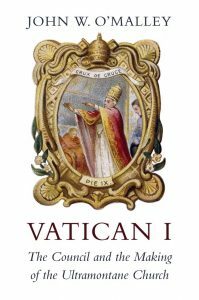 Only in the final two chapters, each devoted to one of the two teaching documents Vatican I produced—Dei Filius on the relationship between reason and revelation and Pastor aeternus on the primacy and infallible teaching authority of the pope—does O’Malley arrive at the Council itself. O’Malley does not provide as much detail on the debates and drafts as one might hope from a scholarly treatment, nor does he lavish on the documents as much attention as they deserve. Nevertheless, as a storyteller, O’Malley unquestionably succeeds in bringing the Council to life, providing for the staid and solemn documents a dynamic narrative background. As O’Malley shows, the Council was simultaneously exhilarating and exhausting for its participants. With characteristic flair for the dramatic and indifference toward the pragmatic, Pius IX overruled the planning committee to ensure that the daily meetings—and not only the formal sessions—were held at St. Peter’s (in the North Transept, an area now roped off for Confession) rather than in Sant’Apollinare, an acoustically superior church off the Piazza Navona. Speeches could thus be hard to hear, an issue only compounded by the fact that they were all delivered in Latin. As so much Latin oratory suggests, the Council represented the best of Old Europe, with the glamorous and tragic Austrian Empress Sisi and the recently deposed Bourbon King of Naples both gracing the opening session. At the same time, the Council displayed the Church’s changing demographics. Of the seven hundred-odd bishops who came to Rome, forty-nine set sail from the United States, as many as hailed from the Habsburg realms. Amidst this glittering and polychromatic backdrop, some of the nineteenth century’s most compelling characters had roles to play. As bishops argued in the aula, Lord Acton, scion of an old Catholic line, schemed against papal infallibility in the Roman salons to which his family connections and personal charm granted entry. For all Acton’s antics, nobody did more to discredit the cause of infallibility than fervid Ultramontane Cardinal Manning. Archbishop of Westminster and, perhaps as significantly, a Balliol man. Manning had the audacity to treat his brother bishops in the Council’s minority the way his MP pals treated the opposition in Parliament: by outmaneuvering them procedurally. Manning’s deck-stacking efforts had no effect on the near-unanimous infallibility vote but to make it seem less fair than it actually was. Then there was the saintly Newman, who, though not much of an Ultramontane, gently coaxed the last stragglers into accepting the definition of a Council he had declined to attend. Above the whole scene stood Pio Nono himself. Grand as a roaring lion and pitiful as a wounded one, Pius IX, forced from his home by Risorgimento troops once before, witnessed his city taken once and for all, as the Unification army stormed the Aurelian Walls and brought the Council to a premature close. Fr. O’Malley has a riveting story to tell, and he tells it with ease and erudition. If few readers would expect a book on a nine-month-long church council to span two centuries of European history, it is because few possess O’Malley’s dexterity at connecting different historical figures and phenomena. Anyone with interest in the Catholic Church and its role in the intellectual and political history of eighteenth and nineteenth centuries would be well served by reading O’Malley’s book. Tyler Dobbs is a recent graduate of Harvard College.